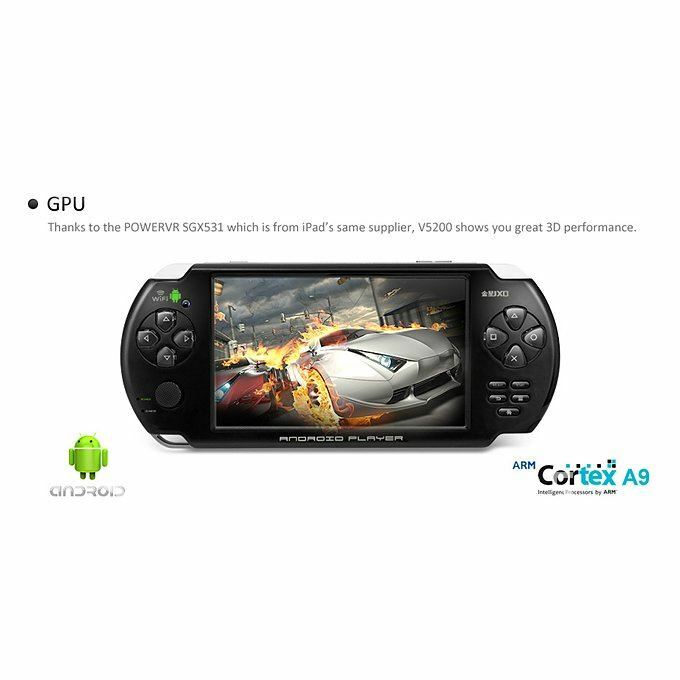 The JXD V5200 adopts the Cortex A8 processor, runs Android 2.3 OS, features 5.0 inch, resistive 2-point touch screen, 800*480 pixels display. The V5200 has 256MB DDR2, 4GB storage memory, support MicroSD card can max up to 32GB, built in 0.3MP Back camera, support Wifi, HDMI output functions. It also support SFC, GBA, FC, MD etc. formats games, RMVB, AVI, MPEG-4, ASP, DIVX, WMV, F4V, FLV etc. formats video playback. It also powered by 2500mah lithium polymer battery, has long battery life. Applications Support 10,000 applications free download, such as office software and study tools etc. Video Support RMVB, AVI, MPEG-4, ASP, DIVX, WMV, F4V, FLV , MOV, MKV and 3GP etc. ; Support YouTube ,TED Mobile and BBC News etc. Audio Support MP3, WMA, FLAC, OGG, APE, AAC, AMR, ADPCM, L-PCM and AC3 etc. Charging via 5V 2A DC 2.5mm power adapter. TFT Screen MPM Game Player Blue Color +Free Shipping Hot Selling! Free shipping, pmp Game console 16gb+3000 games 4.3"LCD with AV Out,camera,support play GBA,BIN Game.